In the morning we again find ourselves in the ubiquitous Warehouse to pick up a few forgotten things. It’s touted in these parts as a sure sign that Dargaville is a real town. While standing in line Erica asks if I can believe the headline. No kidding, it’s just like Whale Rider, 100 pilot whales strand and 37 die! No, the other one titled “Tourist Couple Suffers Attack“. It seems a Dutch couple migrating to New Zealand were camping in a parking lot, which closes for the night, at Haruru falls on the east side of Northland and were abducted. It is a horrific story and just happened last night. They are pursuing the attackers. We eat a large ‘truckie breakie’ at the local café and read the paper, and then head out towards Cape Reinga. This is one of the noisiest rides I’ve ever been in and that includes grunting diesels. There is the engine sitting between us whining away, the sound of the wind coming through every crack; of tires on the pavement. It can’t be drowned out by music since the radio doesn’t work but it’s such a loud thing I don’t think any speakers could overcome it. There’s also some other peculiar things about this mobile home of ours. Little bits of foam have to be stuck in the glass to keep it from rattling. The passenger window is nearly impossible to roll up or down. There are many switches on the dash that do nothing. It’s a long haul and we stop along the way at the Tree House Hostel, on the other side of the Hokianga Harbor from Rawene. This is the first place we’ve seen that we could imagine living in. It’s a very large harbor and is dotted with little villages along its borders. The hostel is run by a couple Aussies and they are chatty and friendly. The place is lovely; they’ve spent some time planting over 8,000 trees on the property. We take a couple walks through the towering Kauri trees in the Waipua Forest. It is an incredible place, with tree ferns leaning over us and bird song loud and all encompassing. The Kauris are massive, and like the Redwoods and Giant Sequoias, it’s hard to imagine people looking at them with anything but quiet respect, instead of the lust to hack them all down for profit. The Maori say a prayer before cutting a tree, planting the same variety when finished. 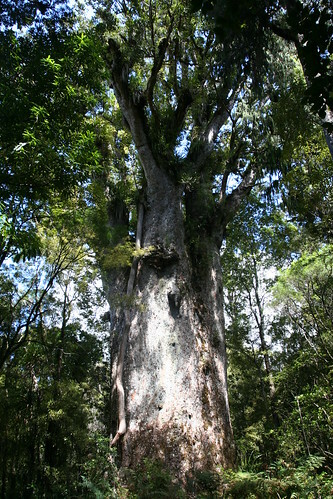 The Kauri tree Tane Mahuta (Forest Lord) stands 15 feet thick and 60 feet to the first branches. After a long nap we head towards Ahipara, a very nice town on the south end of Ninety Mile Beach and it is another place we could see living in. Getting back on the highway in Kataia, we attempt to quickly pass through this bland main town in the area but get stuck again at the Warehouse to pick up a bike rack so they are out of the way and we can move around a little more freely inside the van. Only a little more freely as the ceiling is only 68 inches up and requires stooping and makes for some corner finding with the top of the head. Cape Reinga is at the end of a dirt road and is where the Tasman Sea meets the Pacific Ocean. 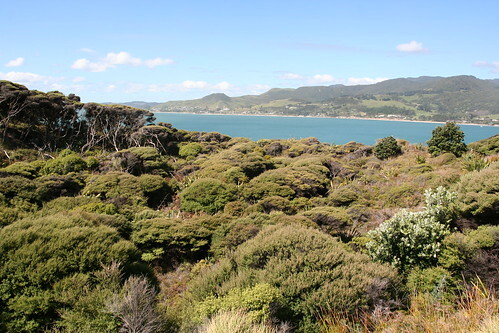 At the tip is a pohutukawa tree where the Maori believe the dead slide down the roots to the sea, climbing back up at a point on Three Kings Island in the distance where they bid farewell before heading back to Hawaiiki-A-Nui, the land of their ancestors. The pohutukawa is also known as the Christmas tree for its bright red blooms in the summer. There is a nice beach nearby where we decide to spend the night. Heading down to the little bay I notice that the brakes feel even softer than when I was test-driving it, and they even smell a little when we get to the bottom. It’s a fabulous bay, with a stream trickling in. We park on the grass and some Swedish girls pull in next to us in their little van. It’s still early in the season and fairly uncrowded.